What is up Everyone? In this episode, Chandler, Evan, and Bryan sit down to talk about the plan for 2019. With Genestealer Cult right around the corner, Bryan is in full prep mode to get stuff painted up as he is making 2019 the Year of the GSC. Chandler talks about how Chapter Approved helped his wolves and he breaks down a couple of lists that he has been made to take to some local events. Evan talks about the plans for his Blood Angels and some of the points adjustments that have helped his lists. The guys talk about their plans for the coming year, what events they are looking on the horizon for, and the lists that they are starting 2019 with. Also, check out the Renegade Open Stream. Don't forget, we are also on iTunes at Facing the Grey Tide Podcast. Subscribe, Rate, and Review to help us improve the show. Don't forget that the Warzone Atlanta is only 1 Week away! If we have 10 more people register by Monday at midnight EST at www.warzoneatlanta.com we will raffle two awesome prizes. 1 brand new in bag set of Early Mark special and heavy weapons from Forge World and 1 brand new in bag Legion Rapier Laser Destroyer from Forge World. If we hit this goal everyone who is registered by that date is eligible! Don't forget that the Warzone Atlanta is only 3 Weeks away! Don't forget that the Warzone Atlanta is only 1 month away! What is up Everyone? This week sees a familiar face join the Podcast again. Mr. Paul Murphy of Forge the Narrative Podcast comes in to talk about the tournament that he is helping to put on in Atlanta called Warzone Atlanta. He stops by for a quick segment and then Bryan, Evan, Ron, and Chandler run down a whole lot of stuff that has been on their minds. We jump from 40k to Star Wars Armada to Painting and Malifaux. We are talking about all of the other fun games that we are playing in addition to 40k. John brings the knowledge and a lot of humor calling certain things out. As mentioned in the show, here is the site for the NOVA Open along with the armies for the Doctors without Borders Raffle Armies. What's up everyone? With the New Year underway, the boys got together to talk about the year that was. We run down everything from what Codexes and Formations came out to the tournaments and games we played over the last year. We end 2014 in 2015 looking forward to an incredible year of playing a hobby that we all love. So sit back, enjoy, and welcome to Grey Tide. So you can follow along in the show. What's up Everyone? It's another week and another Podcast episode from the boys at Facing the Grey Tide. Tonight, we are Three Amigos getting down on the Tyranid Dataslate, Codex: Legion of the Damned, and Imperial Knights. It's another great night on the Podcast and I hope you enjoy it. Hopefully you enjoy some outtakes from the pre show. What's up everyone? Here is the third episode out from the boys at Facing the Grey Tide. Tonight we try to help out Bryan as he faces down his Grey Tide, the Missions for Darkstar, and we try to talk about some of the interesting points of this GT. What's up everyone? Here is the Second episode out from the boys at Facing the Grey Tide. We finish our break down of the book, we throw out some lists, and we hunker down on what we see as the best list going forward. What's up everyone? Here is the first episode out from the boys at Facing the Grey Tide. 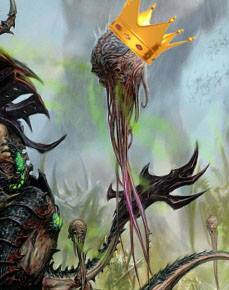 It is the week of Tyranids here on the blog, and we are looking through the Codex and breaking it down section by section. We get halfway through the book, but we break almost everything down.